To millions around the world, Andy Williams always arrived just before Santa. 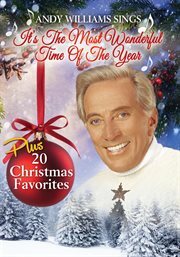 Year after year Andy Williams' Christmas television shows put the wreath on the door, and "It's the Most Wonderful Time of the Year has become the most popular Christmas song in the country. Sung only like Andy can, enjoy more than 20 Christmas favorites and special guest appearances by Andy's brothers and the Osmonds, who began their careers on the Andy Williams Christmas Show!